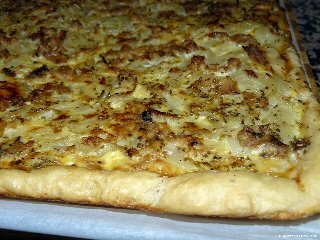 Coca de cebolla is yet another regional Catalan variation made with slow cooked onions as a base. 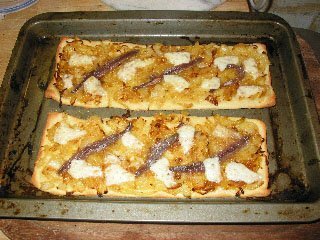 Coca de cebolla ( lit.onion flatbread) dough base is very thin and oily and the almost caramelised onions make this absolutely delicious as a lunchtime snack. You can add anchovy and manchego cheese as a more filling meal. Traditionally Coca ( pl ‘Coques’) is also made with wood roasted sweet peppers. Nowadays bakeries add all sorts of toppings like tuna, salmon, courgettes and tomato. Make a pizza dough and when rested, stretch out into rectangles the size you want your Coca to be. Fry onions in oil or butter until brown, gooey and caramelised then leave to cool. Spread over the stretched dough then add ingredients of choice- roasted tomatoes, roast red peppers, cheese, anchovy but keep it simple with a few choice herbs like thyme or oregano and salt and pepper. 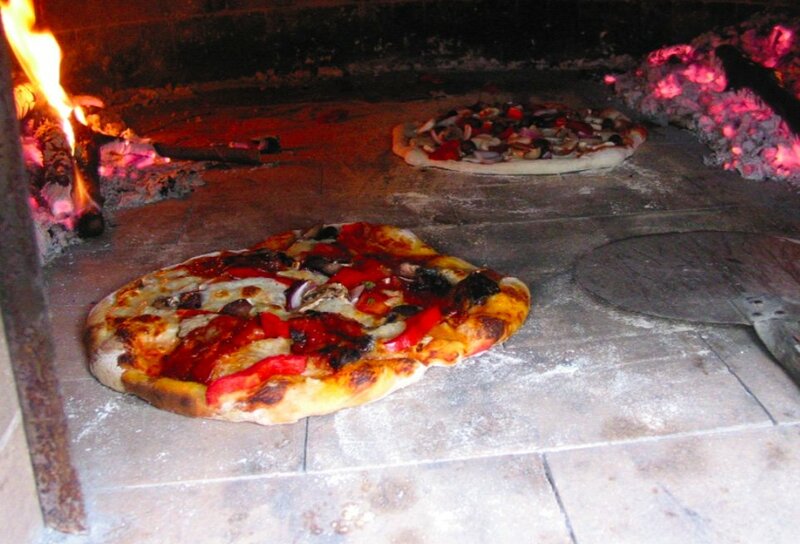 Slide into wood-fired oven until risen and browned on top. Eat hot or cool completely for a snack the next day. Delicious! 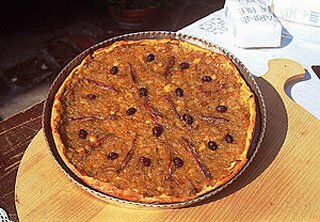 Make the same pizza base but spread black olive paste mixed with olive oil over it instead of tomato then add slowly cooked onion so it covers the olive paste. 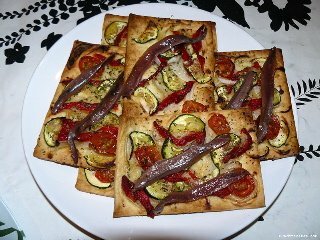 Add salted anchovies as decoration. Sprinkle with thyme leaves and bake as before. See a good authentic recipe here although use your favourite dough recipe We recommend baking this either in a tin as shown in the photo or as a ‘pizza’ straight on the hot hearth of a wood-fired oven. Either way it will be delicious! Serve sliced as a starter with aperitifs or cold Provençal rosé wine. 1½ tsp dried yeast or sourdough starter. Pizza dough takes some practice to get right. Some people put oil in the mix, I never do and its traditionally Neapolitan not to. Keep it slow and cool and never rush it. This recipe will work in a home oven with a baking stone but really kitchen ovens never get hot enough. Hand-stretching is key to a good base so please practice- I’ve put a link to a You Tube video in the recipe so you can see how its done. Getting air in the edge or cornicione is very important and when well risen on baking will stop the crust being too heavy. Don’t whatever you do, don’t ever, ever use a rolling pin even if Jamie Oliver does! Combine and dissolve the yeast in the water. Crush the salt and mix with the flour. Pour yeasty water into a well in the flour and slowly bring it together. When the bowl is clean, pull the dough and flop it over itself twisting slightly as you flip it. Keep working the dough until it is smooth and silky, about 10 minutes and then let it rest. Either divide into 270-300g portions in a plastic proofing box or keep whole and let it rise in the bowl covered with a bag overnight in the fridge or as time allows. The flavour will be better the longer and cooler you can leave it. 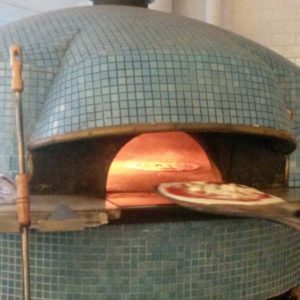 Some pizzaiolos leave their dough for up to 3 days! 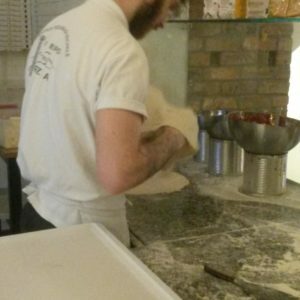 Remember when forming your dough balls to keep pulling the surface tight either on your worktop or with your hands. Take your portion of pizza dough and press it into a flattened circle with your fingers. Keep pushing the dough out until its wide enough to pick up with both knuckles underneath. Gently stretch the pizza dough by pulling your knuckles apart and work your way round until the dough thins. Put it back on a dusted surface and push the thick edges thinner and thinner as far as it will go, stretching all the time until you reach about 12” in diameter. 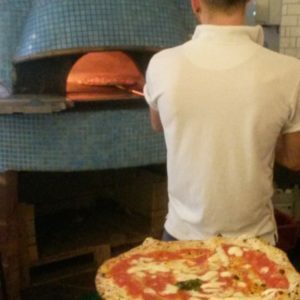 To dress the pizza say for a Margherita, spread a ladle full of sieved and pureed tomato pulp or passata so it stops just short of the edge. Add drained and squeezed mozzarella in dots all over the surface, sprinkle with fresh basil leaves and drizzle some olive oil in a spiral over the top. 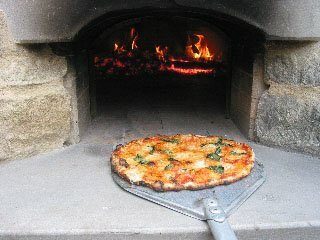 Slide the finished pizza into your hot wood-fired oven( 350-450C) and leave on the hearth for 15 seconds before turning it with a small peel. Continue to turn so the edge has faced the fire all the way round. When the top is hot and bubbling and the crust just starting to spot and burn, slide a small metal peel in and remove the fragrant pizza and drop it on to a plate for serving. Sprinkle a bit more sea salt over, a good whack of black pepper and eat hot. 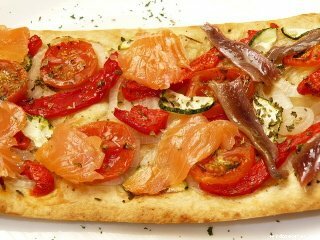 Pizza recipes and dough recipes are all over the internet and vary from baker to pizzaiolo but there are few things which crop up again and again in almost every post or video: sugar and yeast and olive oil in the dough. Contrary to what you may see or hear, you don’t need sugar to get yeast going. Just dissolve it in warm water and add it to your flour. Flour has enough sugar in the carbohydrate to activate the yeast. This goes for bread making as well. The dough will also taste better if retarded overnight in the fridge and then brought back to room temperature before you bake. The cooler the dough, the more it will ‘pop’ in the oven as the gas in the dough expands rapidly. Olive oil is not traditionally added to a pizza dough. It is 00 flour, yeast, salt and water. Olive oil will make the dough softer and difficult to crust properly on the hot hearth and is not needed. It is added when topping the pizza, as a drizzle and will help to fuse the ingredients together. As a well known pizzaiolo in the US quite rightly pointed out, pizza is NOT bread! Pizza is a leavened flatbread which should just bubble up in places and not puff up like a slice of Kingsmill. As a word, pizza is related to and derived from the ancient greek pitta and similar breads are found all over the continent from pissaladiere in France all the way to Turkey’s pida and middle eastern pittah. Traditionally cooked at high heat in a brick oven, these breads are a staple food combined with simple fresh ingredients and not a dumping ground for anything that comes to hand from the fridge. The modern pizza has regional variations even within Italy and changed character somewhat when taken to the US with the deep pan pizza of Chicago. Humble pizza recipes continue to evolve with new toppings added daily as the concept spreads across the globe. This PDF file is kindly shared by Forno Bravo.